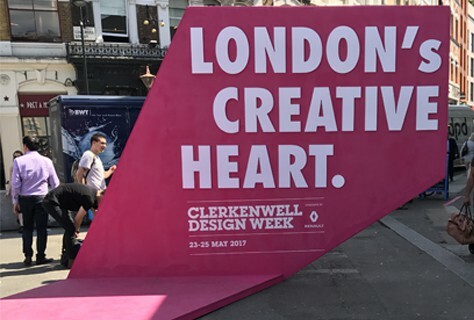 Last week, quite a few of the D4R team ventured to Clerkenwell Design Week in the sweltering sunshine – not that we’re complaining of course! 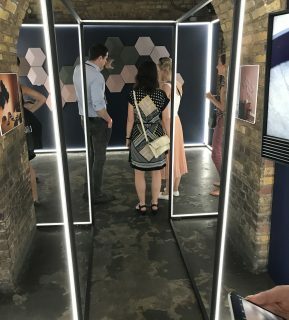 Throughout this blog post, we’ll share some key points of interest across the exhibitions and showrooms. 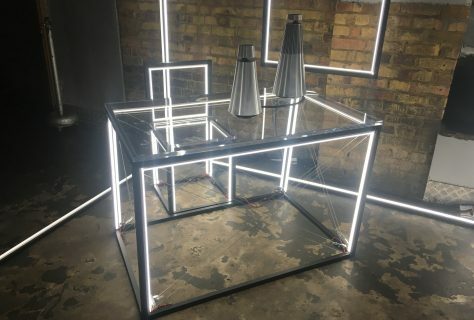 First stop for us was Icon House and although each exhibitor showcased some fantastic furniture design, it was Bang & Olufsen whom caught our attention. 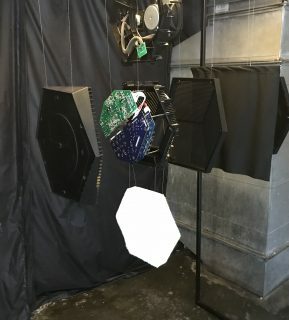 We last saw the release of their BeoSound speakers at IFA, Berlin last September which you can read more about here. 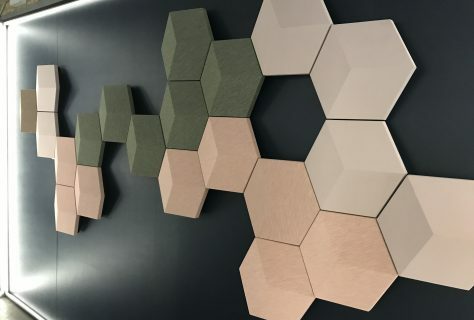 Their space at Clerkenwell was devoted to their BeoSound Shape (it’s first showcase in the UK) and you’d be quickly forgiven for thinking this product was a stunning piece of wall art! The walkway to this space was designed with a black metal structure, complete with a pulsing neon light. This design was mirrored for a desk + chair set up, featuring the BeoSound speakers. 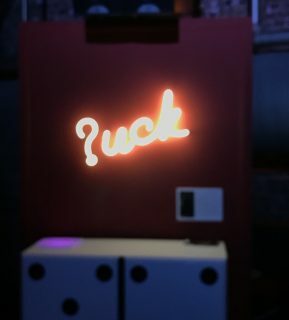 With subtle nightclub vibes to honour Fabric, this was by far our favourite part of the Icon House exhibition. 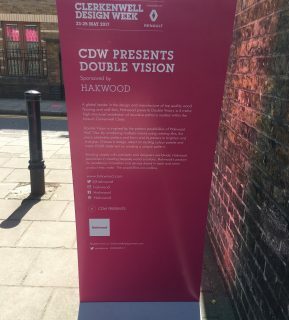 We continued to follow the dotted pink line around the design festival and stumbled across the CDW Presents Double Vision, sponsored by Hakwood. In the words of Hakwood, the structure “celebrates pattern and form and its powers to brighten and energise”. 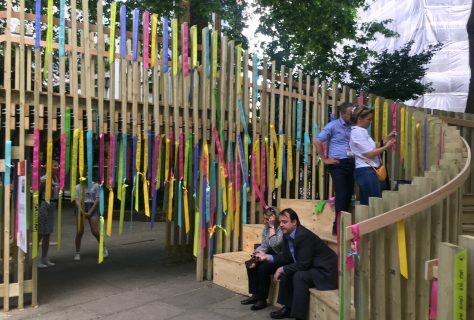 We’d seen so many images of this piece on social media and we can see why, as it definitely caught our eye. The BuzziJungle – with its ideas of turning the conventional meeting space on its head – was also a key part of CDW. 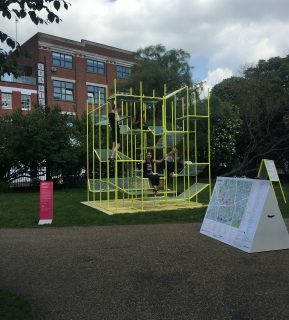 Its bright colour and jungle-gym aesthetics wouldn’t look out of place in a playground – although no children could climb aboard – but the project was for lounging or meeting as part of a workspace. 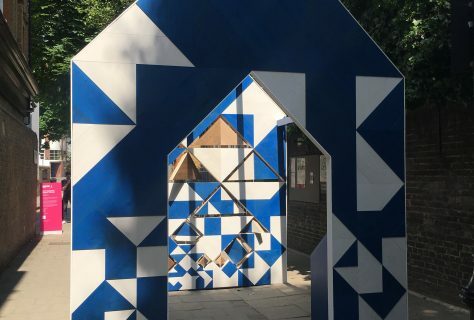 The Next Generation Design Pavilion was the result of educational workshops where students created an architectural design to encourage social interaction. 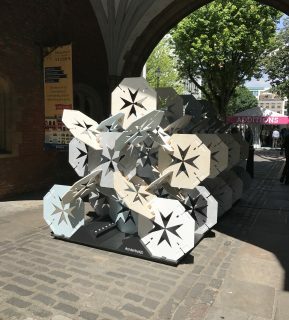 As we moved through the venues, we found each sculpture or art piece along the way incredibly interesting – especially in terms of shape and form. 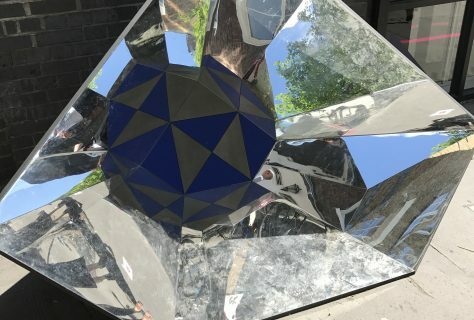 In the bright summer sun, the reflective mirrors worked really well.